Democratic socialist and Pennsylvania State House candidate Kristin Seale talks to Jacobin about Medicare for All, the state of class consciousness in America, and the Democrats’ failure to challenge right-wing talking points. My district is a very mixed-income district. And what I’ve found, no matter what door I knock on in this district, healthcare is an issue. Every single person, if they haven’t had a bad experience with our healthcare system personally, they have a close friend or family member that’s suffering some level of trauma at the hands of our current system. Even folks who have good employer health coverage are suffering. In the specific situation of my own family, our coverage right now through my husband’s employer carries a copay of $60 for every visit. We’re a working-class family that is fortunate enough to have healthcare. But if anyone in my family has an ongoing need for visits to a doctor like therapy or physical therapy or a mild medical condition, we run out of our FSA [flexible spending account] usually by March and then we’re paying $60 out of pocket for every single visit after. This is the situation for people who have insurance. And then of course there are those who don’t. So it’s an issue that cuts across society. Medicare for All is polling really well right now. It seems like there’s a lot of people with a personal stake in transforming the health care system. Absolutely. And this is a main part of the reason I wanted to partner with Philadelphia DSA, which had already been conducting a really effective Medicare for All canvass campaign in Philly. I just had an instinct that this was going to be a strong issue for my district. Anecdotally, we saw signs early on that we were right. We did a canvass in my district with Philly DSA right before my primary, and the feedback we were getting at the door was just shocking. I spoke to one Republican man who’s old enough to be my father and he asked me what do I stand for, what are my issues? And I started to sing it, and he’s like, I’m going to stop you right there. Medicare for All. You’ve got my vote. You can stop now. In the end, when we got our poll results back, Medicare for All polled as the top message in this campaign. And my opponent in this race is a Republican who takes money from Blue Cross Blue Shield, so it’s a very clarifying issue. But still we encounter people who are resistant to socializing health insurance. They have this ingrained idea that they’ll fare better if they look out for themselves, and that pooling our resources as a society leads to the degradation of care. Yeah it requires a major shift in perspective. But people can make that shift. I talked to one woman recently who said how much she appreciates my specific perspective on healthcare as a legislative priority. She told me that years before she had done a semester abroad and had stayed with a host family in Europe. She came from a very conservative Republican family, and she was so confused about why anybody would be happy to pay taxes for other people’s healthcare. And she was pretty young and was asking a lot of questions about it, and someone in the host family said to her, well, yes, of course I want to pay for someone else to have healthcare when they’re sick, and when I get sick they’ll pay for me. And that was like a light-bulb moment for her. We’re having those light-bulb moments here. It reminds me of something I read recently about a Scandinavian country that instituted a pretty robust parental leave policy. At first it was somewhat radical to people. And then a couple generations down the line, it just became obvious. You start to realize that your parents benefited from this when you were a baby, and that when you have a baby, you will benefit from it as well. It’s really not about subsidizing other people. It’s about taking care of everyone, including you. Absolutely. You know I had the experience of giving birth to one child overseas and one child here. There, I got the third trimester of pregnancy completely off of work at 90 percent of my salary. Then after I gave birth I had a hundred percent of my salary paid to me for three months. And then when that three months was over, I got to decide whether or not I wanted to ask them to hold my job open for the next 12 months without pay. So if I wanted to spend another 12 months at home with my baby, my job would still be there when I got back. In the United States, I was on Medicaid. I found out I was pregnant when I was uninsured, and this was before the Affordable Care Act, so pregnancy was a pre-existing condition. I was actually really fortunate to be on Medicaid, but long story short, I had to stop working, and I certainly did not receive any income to be home nursing my baby after she was born. Yeah, and there are lots of people who are put in an extremely difficult bind because they literally can’t stop working. They can’t survive without the income. So they have to rely on family members to provide childcare when they go back to work. But if they don’t have relatives with free time, then they have to seek out childcare, which can be inordinately expensive. Sometimes it just leads to a spiral of debt and eventually financial catastrophe. And it’s a health issue too. If you’re healthy and able to nurse and nurture and spend time with and bond with your baby, that impacts your child’s health for life. Places with socialized medicine, with paid maternal leave, these are places where mothers and babies are able to have their basic minimum needs met, which improves the overall health of all families. So why don’t we have socialized insurance or socialized medicine in the United States? Who’s preventing us from doing that? It’s absolutely corporate greed. It’s got everything to do with healthcare corporations, manufacturers of pharmaceuticals, manufacturers of prosthetics and other health care devices. These corporations’ profit margins are the reason why they are a powerful money lobby in everything from a state legislature to Congress. And of course Citizens United only made that worse. Strengthening corporations’ voice in electoral politics has just helped them double down on making sure that they maintain control of our healthcare system. And it’s not just healthcare. What about other areas where a corporate lobby is preventing us from having the kind of robust socialized system we need to provide a decent standard of living to everyone? Your platform mentions school vouchers, for example. In Pennsylvania, we have a state constitutional mandate to provide appropriate free education to everyone, but we’ve also got a Republican supermajority legislature that has starved our public schools of almost every revenue stream possible, and choked our state education funding to historic low levels. Property taxes are pretty much the only sustainable method we have of collecting revenues to fund our schools. This means that if you live in a poor district, you actually get squeezed more than in a town that’s higher-income, where you already have a really good school system and decent class sizes. So inadequate funding ends up punishing the poor. Our funding is now at 37 percent of the total cost of education. Add to that the burden of many, many legislators with a lot of interest in charters and vouchers, which we’ve already proven are not successful. I don’t think that we should be spending public funds on schools that potentially are able to discriminate against our children, discriminate against their parents and, and could be unsafe for some populations of kids. We shouldn’t be in the business of telling mothers in underserved communities what to do with their kids. I don’t pretend to know what the solution is for each parent, just that we have to adequately and fully fund our public school system. It’s the same old story as with anything that’s a public good. As conservatives gain power in elected office, they set about the very systematic work of underfunding, understaffing, and dismantling public services through attrition. They starve it of any resource that it needs, bring it to the brink of failure. And then it makes what they’re saying seem true, that we have to privatize it. Right, it’s death by a thousand cuts. You bring something like public education or public housing to its knees and then you point at it and say, look, what an utter failure. Only the market can solve this problem. The magical self-regulating market. And quite honestly, I put that squarely at the feet of progressives and Democrats, who have failed to master arguments and rhetoric and a philosophy against that. I think mainstream Democrats have failed to push back against privatization because there’s actually a large swath of the party establishment that is beholden to corporate interests. Their careers are bankrolled by donors who make their money in school privatization or private health insurance, so they’re not really interested in pursuing the kinds of anti-austerity arguments you’re talking about. Meanwhile, I think progressives have failed because we don’t have a strong tradition of class politics in the United States right now. We on the Left have been consistently reactive instead of proactive. Let’s take it back to the eighties, when Republicans started to circulate poor economic arguments that don’t make any sense. They simply repeated and repeated trickle-down economics, and even though saying something doesn’t make it true, it became common sense. And the left didn’t have any kind of strength in setting the tone. We’ve failed to lead the conversation on economics. I think so. Coming out of 2008 was a real awakening for a lot of working people, and I think that if the conversation is changing, it’s changing because working people are finding some extra ounces of fight in their bandwidth. Some of the change is definitely coming from people who really suffered in our last economic recession. And those people are really different than I think some people expected. For example, you’ve got boomers who thought that they understood how life works and what they could expect out of their jobs and out of retirement. And suddenly, at an age where discrimination becomes a big part of the picture if you have to work, they lost their entire retirement investment and are facing having to go back into the workforce, or not being able to leave the workforce. Those folks in some cases have become really activated and really vocal in talking about economic realities and hardship in our country, and what does and doesn’t work. Do you think that class consciousness is rising in America right now? Absolutely. Wealth disparities are growing and there’s no doubt some people are waking up. But I also think that there are still too many people who are tuning out of that conversation, who suffer a delusion that they exist in a different class than they actually do. Many people don’t understand that they’re working-class. They still have an allegiance to wealthy elites. They think elites will help lift them up in their lives. So what is the agitational potential of campaigns like yours to help people realize where their class interests lie? The potential is high. The cost of higher education and the issue of medical debt have really helped galvanize people, and bring them into a greater understanding. When you say we could eliminate medical and student debt, it allows people to stop for just one moment in their hard-working lives and think about what their life would be like without the burden of that debt, what kind of wealth that they could be building, what things they could be doing for their family, what passions they could be following, how could they invest in themselves if they weren’t suffering the burden of that debt. I think that when we’re talking about tuition-free education and Medicare for All, those are both issues that are bringing people to our side. It’s not just because it’s a common-sense argument. It’s because people are able for a minute to stop and think about an alternative future for themselves. Right and after they’ve had that fantasy, that daydream of a different life for themselves, ideally they realize what’s stopping them from having it — which is millionaires and billionaires, the winners of this capitalist system. So what kind of system would you like to see instead? I would like to see instead workers sharing in the wealth that they create, sharing in what their labor bears. That’s a really huge shift, it’s not something I expect to happen overnight, and it’s something that workers have fought for long before me. I don’t think that there is some quick and easy solution, but I do think things will get better for working people if we continue to fight against the privatization of public goods that we already have, and continue to be strategic and thoughtful about what things would be better for communities if they became a public good. 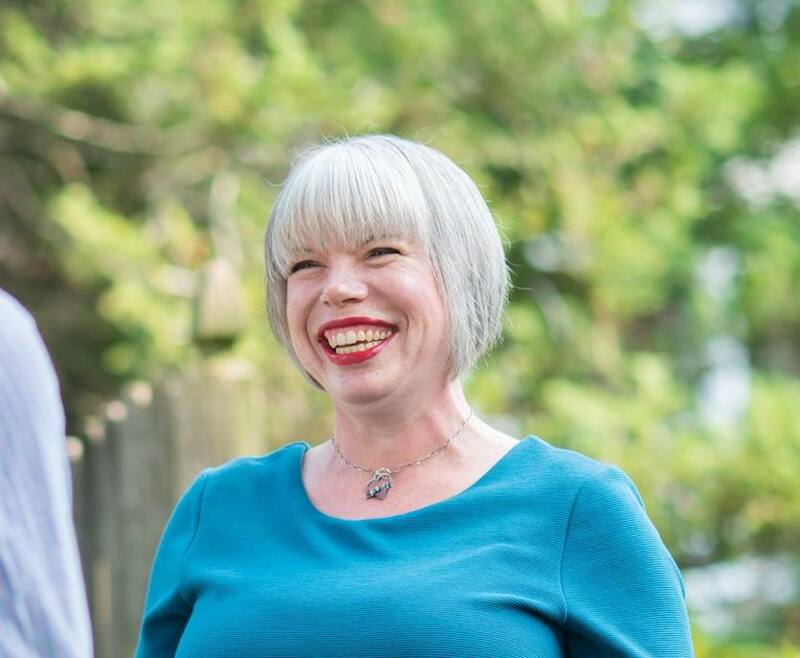 Kristin Seale is running for state representative in Pennsylvania's 168th district.